As Vancouver's beaches become no-go areas after a toxic fuel leaked into the waters of Vancouver's English Bay on Wednesday afternoon, the CBC's Jason Proctor looks at criticism of the emergency response. Joe Spears calls it a wake-up call. An international shipping expert, Spears says Canada is supposed to be a world leader at dealing with maritime emergencies. 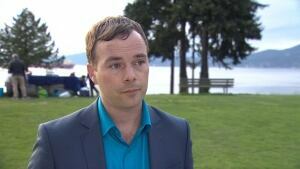 But he says the response to an oil spill into Vancouver's English Bay on Thursday was anything but world class. "We've got to do better," he said. "We're Canada's largest port. We've lost our way." Spears joined a chorus of critics who said the spill reinforces fears about proposed pipeline expansion, which could bring increased oil tanker traffic into the B.C. 's coastal waters. The City of Vancouver has repeatedly questioned the potential impact of a proposal by Kinder Morgan to twin the TransMountain pipeline that carries oil to Burrard Inlet. And the province has set a "world-leading marine oil spill response" as one of five requirements for the approval of any heavy pipeline proposal. But even as critics pointed to perceived problems, Coast guard assistant commissioner Roger Girouard claimed the response was textbook. "From where I sit, from an operational perspective, this has gone in accordance with the doctrine," Girouard said. "Port Metro is the largest port in Canada. They have a very solid team. They saw a problem, they called in the partners and we've put together a unified command centre to be able to take a look at this and do it the right way." But Spears says responders should have tracked the movement of the spill with buoys and drones within minutes of becoming aware of oil on the water. He also questions a perceived lack of communications that saw City of Vancouver officials alerted to the spill 13 hours after Port Metro Vancouver first learned about it at 5 p.m. PT Wednesday. "To make a world-class response means more than words," said Spears. "We've got to bring all the players together. This is a glimpse of the future. If we can't handle a small bunkering spill, how are we going to deal with a major tanker?" Vancouver City Coun. Geoff Meggs raised similar concerns about the failure to notify the city immediately. "What may seem like a small spill to an offshore mariner is very, very significant to the people of Vancouver. These are some of our most precious public assets," he said. "So it's in that context that we probably need to have a further conversation, so that they understand what's important to us." The NDP's Spencer Chandra Herbert, the Official Opposition's environment critic, said citizens should be part of that discussion. The MLA for the Vancouver-West End/Coal Harbour represents a riding that sits directly in the path of the spill. "People were out there last night, playing with their dogs, having fun in the water. Meanwhile, we were having bunker fuel oil — they still can't tell us what it is — in our water, potentially causing harm," he said. "I think it's a huge wake-up call." Girouard acknowledged the public's concerns. "In an absolute sense, it could have been better," he said. "One of the challenges with this many jurisdictions and partners is, 'Who's got what piece? ', and it took us a little while to get through that."